Before jumping in: is a LED display addon possible? Before jumping onto this amazing WeatherDuino wagon, I want to ask if it's possible to add an external large LED display. I later (2017) made my own 4 digit Arduino alphanumerical LED displays which tap into the serial data stream of the Ultimeter to display the weather data of my choice. 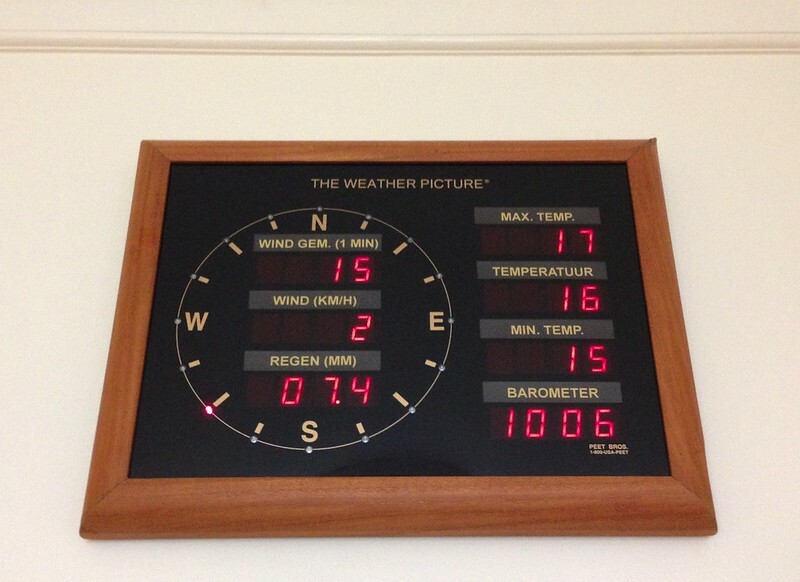 So in one display I can put as many displays as I want which will display weather data selectable via DIP switches. I think this should be also possible with the WeatherDuino? If so I can make several RF receivers in the 'Weather Picture' style! That would be awesome!! All I need is to tap into the received data. So maybe I answered my own question but thoughts of experienced WeatherDuino users would be appreciated. Welcome to the forum and thank your for your interest in the WeatherDuino system. I can't say that your goal is possible, however I also don't see that it can't be done, once you know the requerid serial protocol to feed the 'Weather Picture' and are able to program. Thank you very much for your reply... I would certainly like to try this... Me, my wife and visitors always look at the weather picture display, so it would be 'hard' to do without it. It was fun to write code to read the serial data of the Ultimeter so now I can try to do the same with the WIFI data as you suggested. I will order the system via a PM! I'm undicided which wind sensor to use, the Peet Bros unit is very sensitive and only 115 euro's. (Davis 6410 is 175 euro's) But the Peet Bros unit has reed sensors (no hall) and a very clever way to read the wind dir and speed but WeatherDuino need a output of 0-5V so maybe I will make an Arduino conversion board or try the new Davis 6410. Anyhow, the WeatherDuino system is amazing so consider me hooked! I don't believe that the serial data format is as well documented as can be downloaded from Peet Bros., but if you are familiar with Arduino coding then you should be able to "reverse engineer" the data. (13-04-2019, 08:36)edr1924 Wrote: I'm undicided which wind sensor to use, the Peet Bros unit is very sensitive and only 115 euro's. (Davis 6410 is 175 euro's) But the Peet Bros unit has reed sensors (no hall) and a very clever way to read the wind dir and speed but WeatherDuino need a output of 0-5V so maybe I will make an Arduino conversion board or try the new Davis 6410. Good quality Magnetic Reed sensors are extremely reliable, so IMHO not significantly inferior to Hall sensors, even for an anemometer. However, I was very surprised to learn that anybody uses a potentiometer for wind direction (even Fine Offset used reeds in their sub-100 Euro stations). But I guess that Davis must use a very high quality "professional quality" potentiometer, perhaps like used for mixing desks, etc.? The Peet Bros method is much more elegant and I believe produces a simple "pulse position" output (albeit with a variable frequency). That could be converted to an analogue (0 - 5v dc) voltage using just a "flip-flop" (bistable) followed by a (very) low-pass filter (many seconds time constant). But a microcontroller method would be better, for example to bisect the angles between the rising and falling edges of the pulses, and to achieve the required very long time constant (i.e. sample and hold). I bought my 6410 much more cheaply (on eBay), but otherwise I would be very tempted by the Peet Bros. anemometer. I note that the (only) UK distributor is selling the complete "low end" station (Ultimeter-100) at the equivalent of about 150 Euros. That includes the same "Professional" anemometer, a console (which also delivers the RS232 serial data for a computer), 12v power supply and external temperature sensor, etc. However, "complete station" is rather an over-statement because the Rain and Internal Temperature sensors are high-priced "options" and it doesn't support Humidity (Out or In) or Barometric Pressure sensors at all. Thank you Alan for your thoughts on the subject and the Peet bros anemometer. Maybe one way to get the data I want on my large LED display is to simply(?) change the LCD output to LED? I do not have access to the code yet but this must be possible? Then I can use a wireless display unit, ripp off the lcd and build it into the LED display enclosure. Good quality Magnetic Reed sensors are extremely reliable, so IMHO not significantly inferior to Hall sensors, even for an anemometer. The reed sensors in my Davis rain bucket system last only for 2 years?? I don't know why but maybe because I used old reed sensors I found in my shack. However, I was very surprised to learn that anybody uses a potentiometer for wind direction (even Fine Offset used reeds in their sub-100 Euro stations). But I guess that Davis must use a very high quality "professional quality" potentiometer, perhaps like used for mixing desks, etc.? Unfortunately I don't have the knowledge to build a conventional conversion pcb but I found a sketch for an Arduino so thanks to your comments I will try to build a conversion system with the Arduino so I can use the Peet bros anemometer with the WeatherDuino. Would be great!